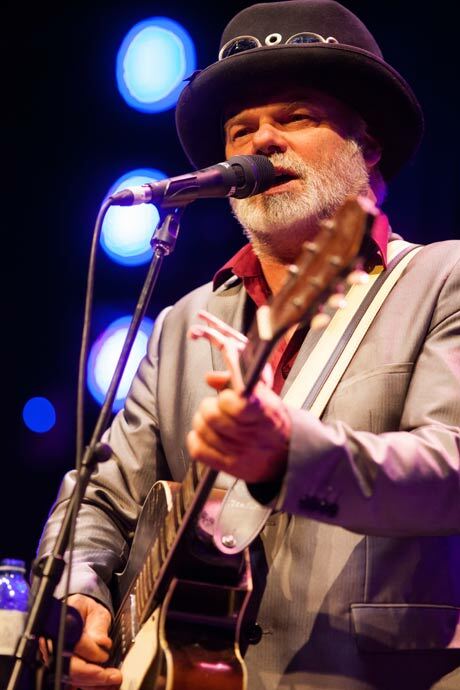 Winnipeg's Park Theatre was packed on Wednesday night for a sold out performance by the Fred Eaglesmith Traveling Show. And while many of the mostly grey-haired crowd could have been a bit more lively, the show itself was a solid one. Opening the night, Tif Ginn sang a half-hour of both new material and songs drawn from her eponymous solo release, with the rest of the Traveling Show band backing her up. "Little White Pills" and "Get Away Car" were standout tracks, but her whole set was strong. Ginn's pipes are impressive, and her stage presence is both captivating and self-deprecating. It's hard to fathom that Ginn isn't mentioned more in the conversations that — quite rightly — laud Lindi Ortega and Lydia Loveless. Hopefully that will change soon. Eaglesmith himself took the stage after a somewhat lengthy intermission, and with his inimitable, irascible stage banter, began a spirited and engaging two-hour set. Starting the night with "I Like Trains" and closing with a solo performance of "Stars" off his 6 Volts record, Eaglesmith pulled out about 20 tunes from across his lengthy career. Recent tracks like "Dangerous," "Careless" and "Drunk Girl" were on display, while classics like the western heartbreaker "Summerlea" and the bluegrass "hit" "Thirty Years of Farming" were given new life by the Traveling Show band. One of the most respected songwriters in the roots game today, Eaglesmith's songs have been covered countless times. And he didn't let the audience forget it either, pulling out live staples "Alcohol and Pills" and "Freight Train," which have received prominent cover treatment from the likes of Todd Snider and Alan Jackson. They also busted out the more recent "Cigarette Machine," a track that Mary Gauthier, one of Eaglesmith's old songwriting pals, performed in the Park Theatre about a year ago, describing it in her introduction as such: "I thought I'd written the song about addiction [with 'I Drink']. But then Fred played me 'Cigarette Machine.'" While Eaglesmith is equally as entertaining between songs, taking playful jabs at everything from urban hipsters to the Winnipeg Folk Fest, cassette tape "resurgence" to "the Cloud," his intermittent monologues on the redeeming power of rock'n'roll hit home hardest. With well over 30 years on the grind as a fully independent artist, and one who makes no bones about his disdain for "douchebags" in "the business," Eaglesmith has had a hard row to hoe. And yet he keeps doing it, 200-plus shows a year, year after year. His drive and work ethic, and that of his bandmates who are the road with him along the way, are certainly things that many of today's up and coming artists would do well to learn from, or at least take serious note of. Above and beyond all that, though, the music was great. The powerful introduction to "Carmelita" was as a spiritual high point of the show, while "Water in the Fuel" must have drawn a tear or two. Rounded out with Ginn on accordion and rhythm guitar, Matty Simpson on lead guitar and keys, Justine Fischer on bass and Kori Heppner holding it down on drums, the Fred Eaglesmith Traveling Show is one not to miss when it makes a stop in your neck of the woods.